We collect the personal information you voluntarily provide to us, which includes your name and e-mail address, in order to subscribe to our newsletter, receive our content, comment on our blog, and/or purchase services or online products. Other data we may collect is detailed below. We collect data from you directly when you fill out a form, purchase a product, or communicate with us via email or social media. We also collect data from you when you use jenniferskitchen.com. We may collect personal data from third parties such as our payment processors, advertising networks, and/or analytics providers. Your data is stored in a secure platform. We use your personal data for processing as outlined below or a reasonably compatible purpose. A. Usage Data. We may process data about your use of jenniferskitchen.com and services. This may include your IP address, browser type, operating system, geographical location, page views, website navigation paths, and frequency and/or pattern of your use of our website. This data is collected through our analytics tracking systems, Google Analytics. This data is used to analyze the use of jenniferskitchen.com, to deliver relevant content, and understand our users. The legal basis for processing is our legitimate interest, namely monitoring and improving our website, marketing, and services. B. Customer Data. When you purchase one of our products, we may process user data, such as name, email address, address, credit-card number, and other relevant data. The legal basis for processing is consent and your affirmative action to enter into such contract with us and/or the purchase and delivery of the contract between you and us. The above Data may be used to send you marketing communications about our business or products. The legal basis for this type of processing is either consent or our legitimate interests in growing our business. We may send you such communications if you requested it and/or if you agreed to receive such communications. 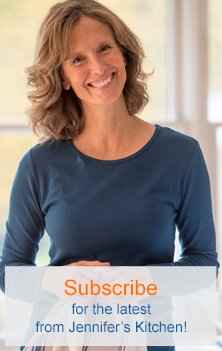 You may opt-out of such communications at any time through the ‘unsubscribe’ button in each email or contacting us at jennifer@jenniferskitchen.com. Your data will never be shared with unrelated third parties. We only share your information with trusted third parties who provide support in running jenniferskitchen.com. Third parties we share your data with will keep it secure and respect your privacy under the law, and we take steps to ensure the companies we work with also comply with the GDPR. We hate spam and we comply with Anti-Spam laws. If you opt-in to receive our newsletter or other communications, the option to unsubscribe will be included in every email. The term “cookies” refers to small pieces of information that a website sends to your computer’s hard drive while you are viewing a website. We may use both session cookies (which expire once you close your browser) and persistent cookies (which stay on your computer until you delete them). You have the ability to accept or decline cookies and tracking signals using your web browser settings. If you choose to disable cookies, some areas of jenniferskitchen.com may not work properly or at all. jenniferskitchen.com may not respond to Do Not Track signals sent by your browser. We do our best to protect your information for any unauthorized access, misuse, or disclosure. Should there be a potential breach of personal data, we have procedures in place to respond. The breach will be identified, the scope will be determined, and we will make reports and/or notification if we are legally required to do so. You agree that we are not responsible for any intercepted information shared through jenniferskitchen.com without our knowledge or permission. Additionally, you release us from any and all claims arising out of or related to the use of such intercepted information in any unauthorized manner. You agree to notify us for any breach of security or unauthorized use of your information. Your data may be transferred to other countries and by using jenniferskitchen.com, you consent to the transfer of information to countries outside your country of residence. If you are located in the European Union, we may store and share your personal data with companies located outside of the European Economic Area. We will always do our best to ensure security of your data. We aim to use US-based providers that are part of the EU-US Privacy Shield. You may always request information on how and where your data is processed and stored.